Available for download, the Slate Digital FG-116 Blue emulates two famed, vintage FET compressors. Both modules model 1176-style leveling amplifiers, specifically the Blue series of these renowned dynamic processors. Both are suitable for bass guitar, percussion, vocals, guitars, and more. You'll find the usual 76 controls: input and output knobs as well as attack and release parameters. For each compressor, you can select among four ratios: 4:1, 8:1, 12:1, and 20:1. There is no threshold parameter. Note that the popular all-buttons-in sound is not available in these emulations. For that sound, Slate fashioned a different, dedicated emulation. These compressors boast distinguishing features not found in comparable plug-ins or even in the original hardware. A mix knob is on hand to dial-in dry, uncompressed signal into the mix. This simplifies the process of parallel compression, as you no longer need to route a snare to a dedicated auxiliary channel to achieve parallel processing. You'll also note the high-pass sidechain detector, quite handy if you don't want the low-end of a signal to trigger the compression. Each compressor has two individual circuits that model entirely different circuit paths. 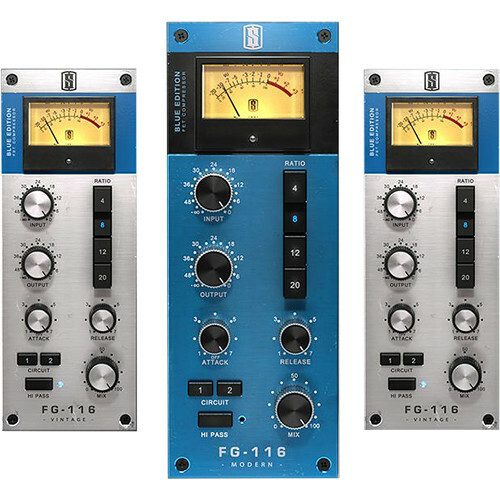 Essentially, the FG-116 is really four compressors in two distinct modules: the FG-116 Blue Modern and the FG-116 Blue Vintage. Both modules operate within the VMR (Virtual Mix Rack) plug-in. When you want to use these compressors within your DAW, simply instantiate the VMR plug-in, and you'll be able to access them within the GUI. The Slate FG-116 Blue Series is Mac and Windows compatible. Each compressor can operate in VST, AU, and AAX formats. An iLok 2 or 3 is required to run the compressors. Note: You must have an iLok 2 or iLok 3 to operate this product. iLok is available separately. Circuit 1 has the classic mid-forward character that made the blue-striped FET compressors so famous. It adds coloration to the upper midrange, providing presence to vocals, bass, drums, and guitars. It has a softer top and bottom end compared to the Black 116 and more articulate transients due to the harmonic distortion in the midrange. Circuit 2 is modeled after a real-world unit that had been updated and refurbished and had its own distinct, musical sound. This model reproduces deeper lows and smoother mids/highs when compared to Circuit 1. It works well on drum-room mics as well as vocals that require more heft and less of a midrange push. In this model, the response is particularly suitable for close-miked drums, bass, and anything else whose transients you wish to preserve. This circuit sports a breathable, yet punchy low-end, as well as a smooth top-end response. As such, it works well when used on instrument submixes.